Here are top 2 Windows 8 radio apps for those who are fond of listening to different types of music, while working. These Internet radio apps let you listen to all types of songs such as old, new, pop, jazz, rock, etc. You can easily Play / Stop, Pause, Pin to Start, control Volume, and view currently playing station. 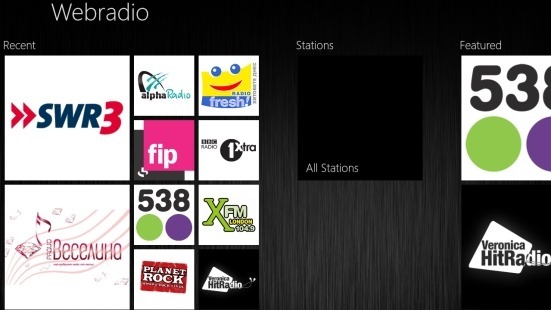 The interesting thing about these radio apps for Windows 8 is beautiful column-based tiles interface. To view al the stations, you need to scroll towards right (using mouse wheel or by using horizontal bar). Below given is a short description of each radio app for Windows 8 to help to use it in a correct way. Tuba.FM is a free Windows 8 radio app that lets you listen to all types of popular music, right on your system. On the home screen, you will see all the recently played stations in one column, featured on another column, following top artists music. There are more than 300 authorized radio channels for you to access. You can also share stations with other via Email, Facebook, Twitter, etc.. In addition, the radio app for Windows 8 lets you search for a specific radio channel or artist by using the Search bar given at the top of the screen. As you open a specific station to listen, you will also find related artists’ songs, or music tracks at the right side of the screen. Read more about Tuba.FM or download it now from the Windows 8 Store (press ‘Win+Q’ on Windows 8 store and search). WebRadio is yet another excellent free Windows 8 radio app that allows you to listen to mixed music tracks on different radio stations belong to different countries such as France, Germany, Belgium, etc.. Radio stations such as Top Radio, Planet Rock, BBC Radio, City Music, Candlelight, FreshFM, and so on are contained in this radio app for Windows 8. You can easily explore music tracks or radio stations from different countries, right at your Windows 8 system. Most of the stations have instant playing ability that plays a selected station, right away. The app has very easy control on buttons like play, stop, pause, volume up / down, etc. Also, you can pin to start your favorite station. You can read more about WebRadio or simply download it from the Windows 8 store (Press ‘Win+Q’ on Windows 8 store and enter the app name).